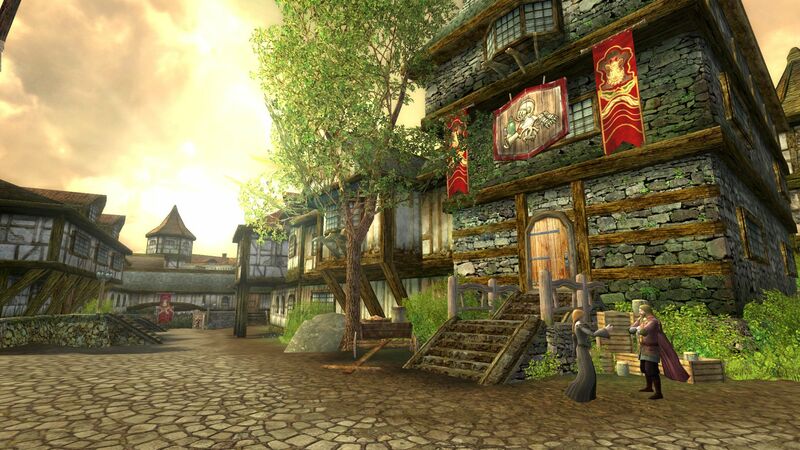 The bustling township of Bree in LOTRO is a busy area for characters from around Level 15 (sometimes even lower) through to Level 120. It boasts an array of useful venues, facilities and views. 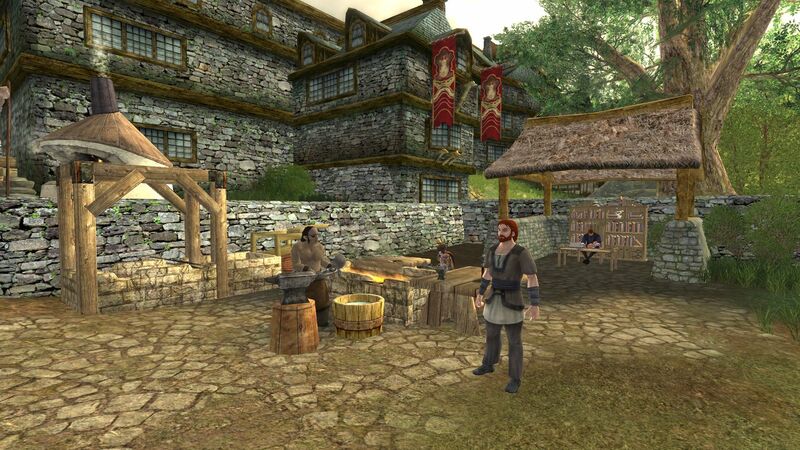 Quite often you can hear other LOTRO gamers playing a well-known tune in the town. This place is usually alive. So, I decided that I would put together a LOTRO Bree Beginner’s Tour Guide. What are the main people and places you need to visit as a new player? Here’s the run-down! Note: Click/Tap any of the screenshots to see a larger version of that picture! Yep this is The Prancing Pony where Frodo Baggins and the other hobbits escape the Nazgûl on their quest towards Mount Doom to destroy the One Ring. Here, as a new player, you will get to meet the Ranger Strider…and later Gandalf the Grey. Apart from the range of local ales what else can you find here? Want a new hairstyle, or to grow a beard (males only – and not Elves either, sorry! ), or even update your character’s facial look? Then visit the Barber. Advisory Note: Do so before you enjoy the ale, not after! 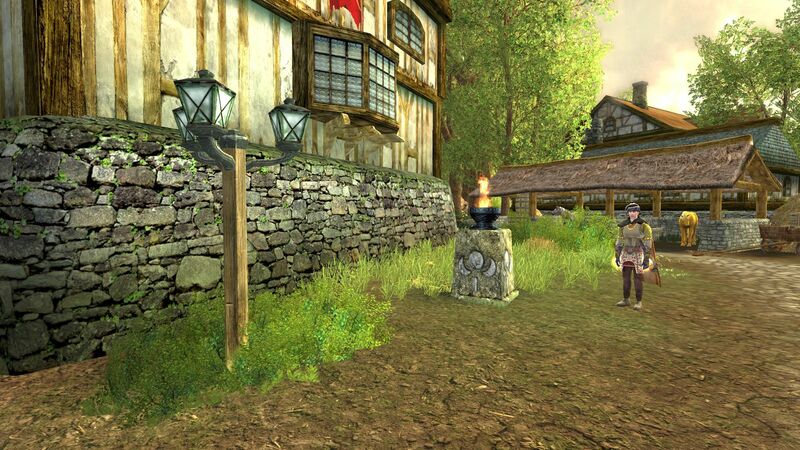 Visit the healer to stock up on potions and salves for your questing – e.g. to remove fear or poison debuffs. You can purchase musical instruments that you have unlocked the ability for from the local bard! 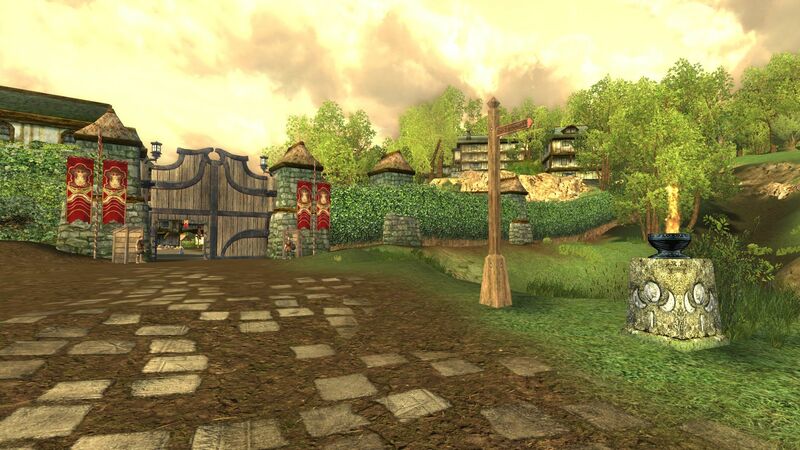 There are two key milestones – one just outside the South Gate near the Skirmish Camp and one right outside the Prancing Pony. Very handy if you spend more time in Bree, rather than outside it! There are a few of these dotted around Bree. Provisioners: sell some basic food supplies to help you recover morale and power in and out of combat. Suppliers: can provide those extra ingredients to allow you to craft your armour, or make that perfect Tater Soup. Both: Can provide you with repairs to your current gear and sell off scrap or unusable items. 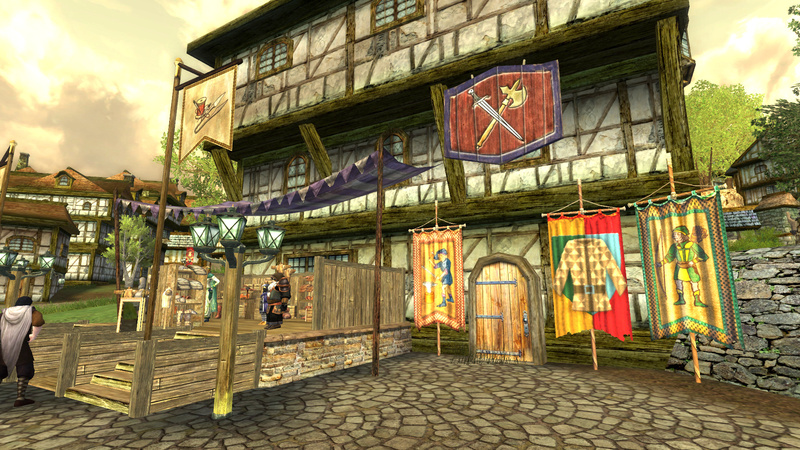 You can also find Suppliers in Bree Crafting Hall and the vendors near the South Gate Crafting Area. There are three main places to do your crafting, and two out-of-the way locations. If you’re a cook, then there is an oven by the Provisioner in the South entrance to Bree. It’s hard to see, but there is, in fact a study in this area too. Look for the man sitting at a desk. Over the path are other facilities: Forge and Workbench. 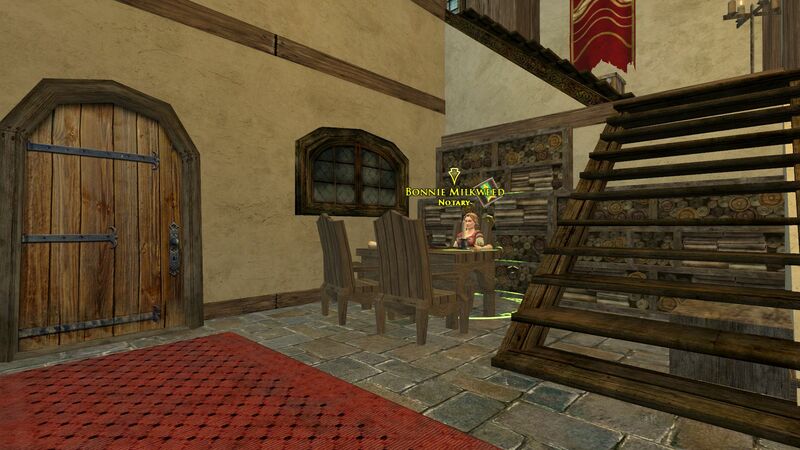 West Bree has what is usually a really busy crafting area: Forge, Study, Workbench and Oven are available. Farming Fields are just the other side of the path! 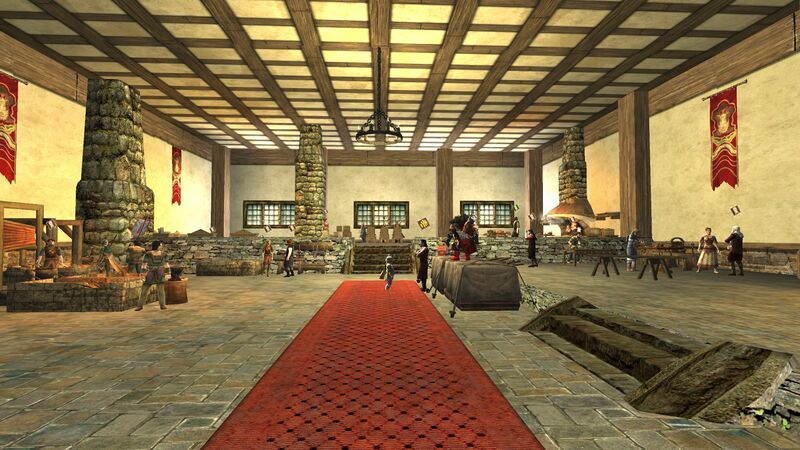 If you want to get out of the cold Middle-Earth winds, the warm climes of the Bree Crafting Hall will be perfect for you. Heated by Forges, you can work up a sweat by stirring, clanging and bashing your way to your next level of gear. The Bree Crafting Hall also holds Vaultkeepers and Auctioneers. Behind Second Watcher Heathstraw is the door to the Mess Hall. In this cosy building is an Oven for you to use, if you have the Cooking Crafting Profession. See: Hunting Lodge Forge for information. 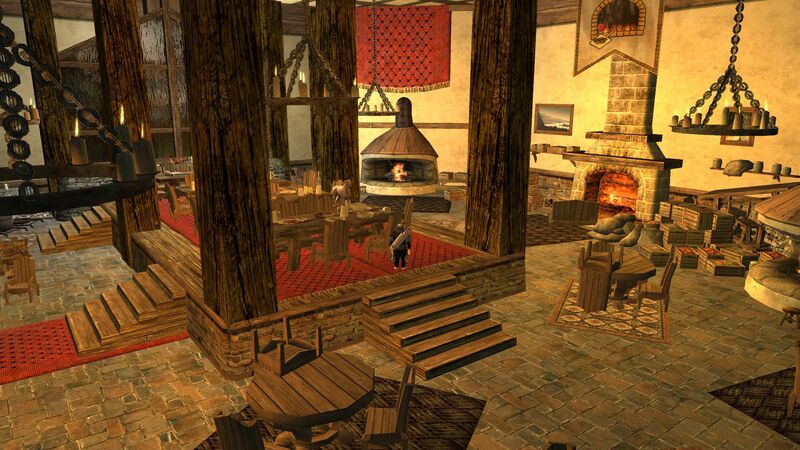 You can come back here to create decorations for your Homestead. If you get a rare item drop from killing creatures, or more easily, fish for a barter item, you can have it mounted here. You can then display it proudly in your Homestead when you choose to purchase one. Want to make some extra coin than what you get selling stuff to in-game vendors? 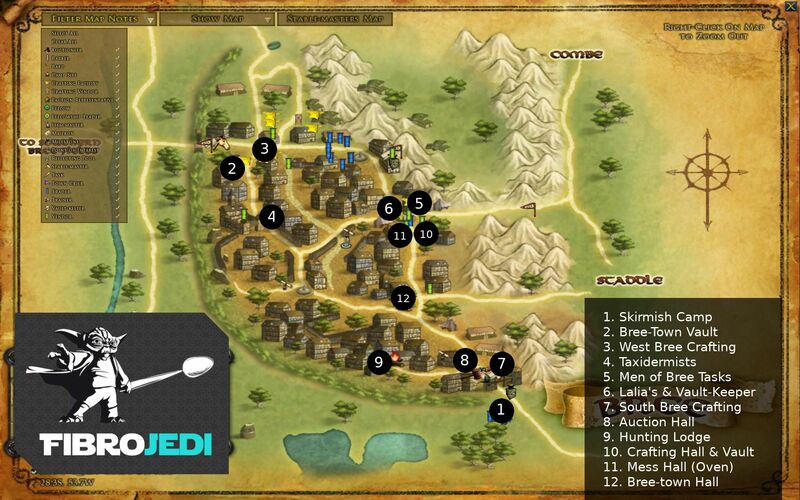 Then head to Bree Auction Hall (see the little Gavel Hammer on the map). As an F2P player, or as a former VIP, you can only try to sell 5 items/stacks at once. But anything extra is better than nothing, right? You can also use the Auction Hall to bid for (or buy-out) any gear-up items you want before your next quest. You can also buy cosmetic gear and pets from here, though watch the prices. As a beginner you may not have the coin for these items. If you have real money to spare then Lalia’s has a visual way of finding the perfect look. The currency you use here is Mithril Coins. 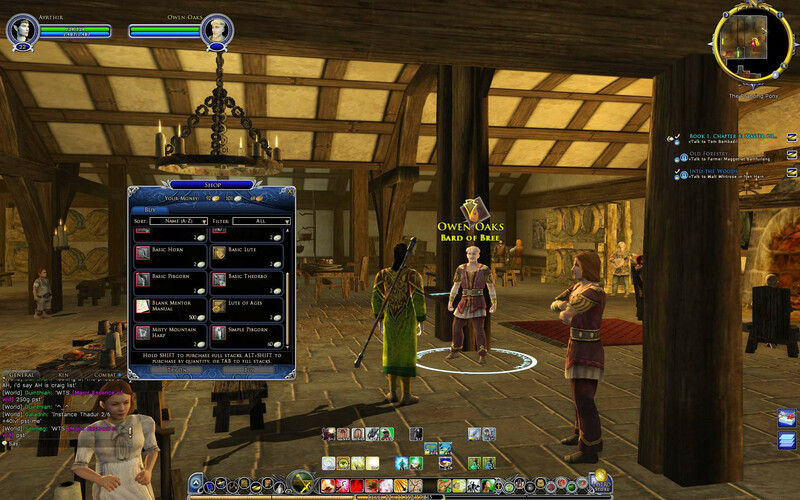 You can exchange LOTRO Points for Mithril Coins at the in-game Store. 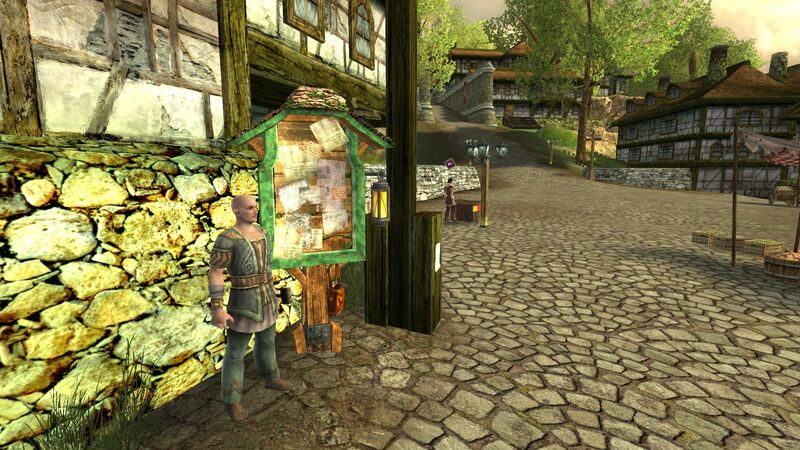 I don’t have real money to throw around, so I come into Lalia’s Market for one reason: The Vault-Keeper (it’s usually less packed with players than the Bree-town Vault). 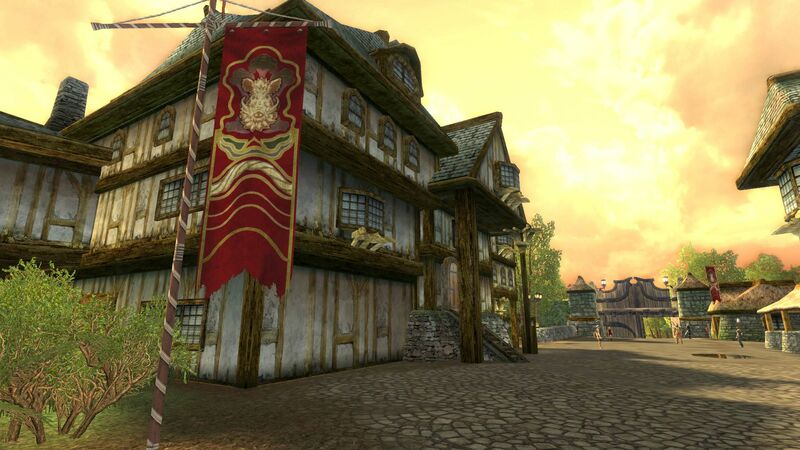 There is a separate Bree-Town Vault if you want to resist the urge to part with real money! Here you can place items for later use and retrieve them at any other Vault-Keeper in-game. 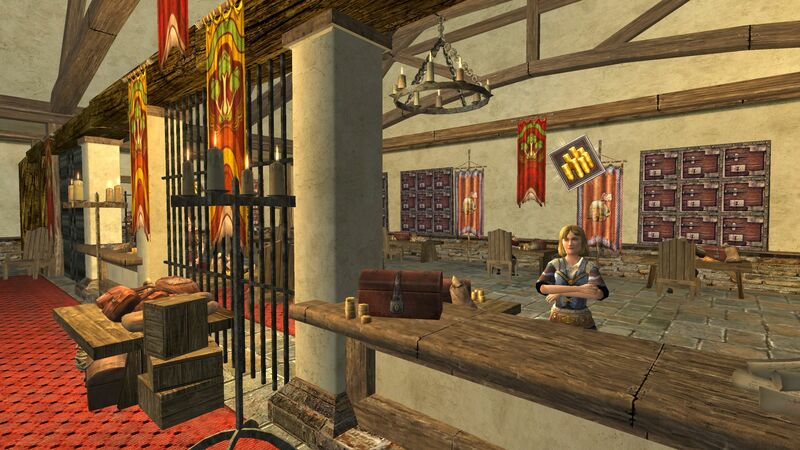 For a few LOTRO Points you can also unlock Shared Storage to share gear among your characters and Shared Wardrobe to allow any gear to be applied cosmetically among your characters. 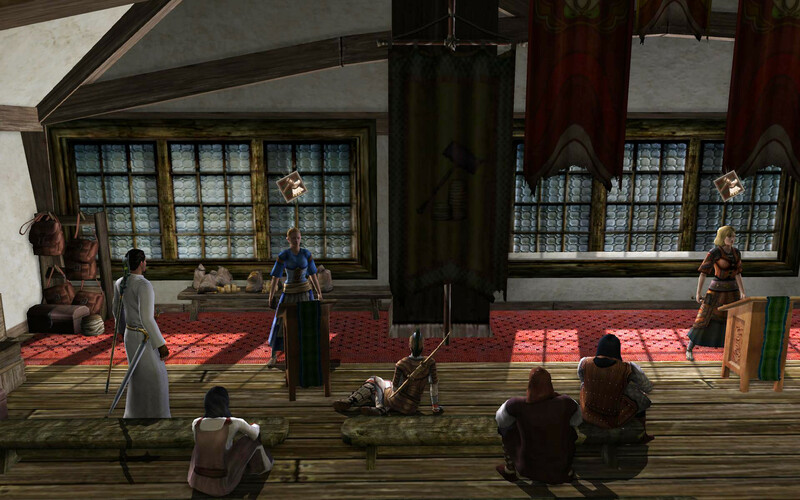 To gain reputation with the “Men of Bree” (also includes Women, by the way), you need to complete local quests – and do tasks. 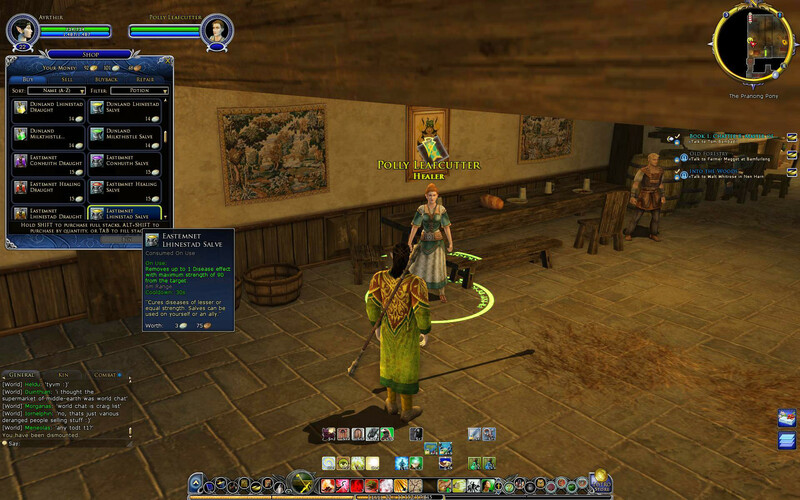 If you’re a LOTRO Beginner and are not an Elf, Dwarf or Hobbit, then Bree is the first time you’ll be coming across Tasks. As you adventure you’ll receive ‘Trophies’ in your loot. Claws, beaks, feathers, skins – anything that’s left overs from a corpse. Nice. If you don’t sell all these you can turn blocks of 10 in for increased reputation with the Men of Bree. You start with a maximum of 5 tasks per day, so take your allocation and turn the rest in for some extra silver and copper. Note: you can also get reputation with the Men of Bree by retrieving Barrow Treasure from the Barrow Downs (Level 20-ish). 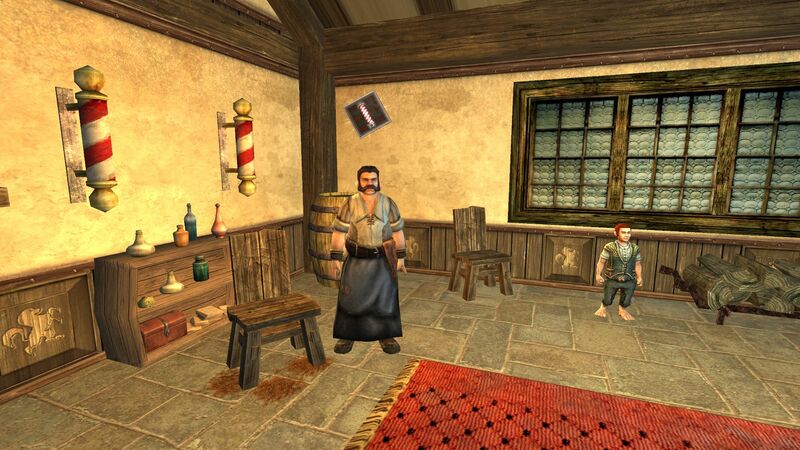 When you receive Barrow-Treasure and Cardolan Trinkets (the Bree version of ‘Well-kept Mathoms‘ for the Mathom Society), just right click them in your inventory to gain the reputation. Want better gear but can’t craft it, or afford to buy it at Auction? Then the Skirmish Camp is the place for you. Selling all kinds of items, from Armour and Weapons to Pocket Items and Cosmetics, you can buy your next gear set using Marks and Medallions. 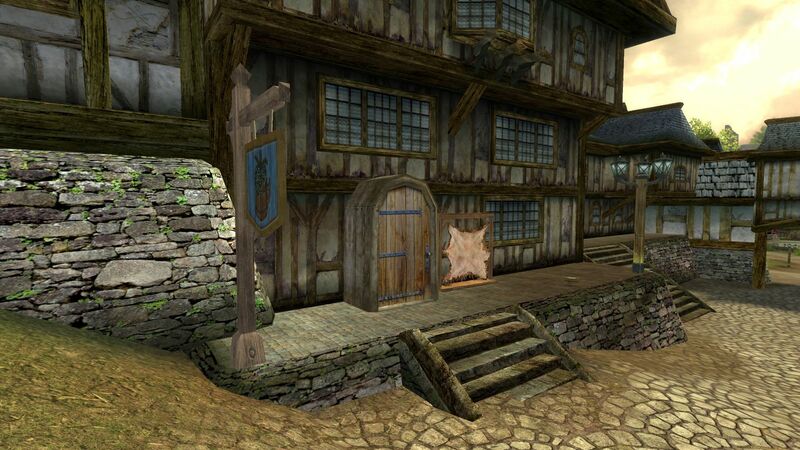 You gain marks by completing deeds (e.g.Shire Deeds/Ered Luin Slayer Deeds) or completing Skirmishes. This currency is shared with all your characters. At low-levels, your Skirmish gear requires very few Marks. Skirmishes at lower levels won’t grant Medallions. If you want some gear/items that cost Medallions as well as Marks, you can barter for Medallions at the Currency Exchange NPC in the Skirmish Camp. Aside from popping in to see the Mayor, as a new player the main thing of interest to you here will be the Notary. If you are at least Level 15 you can speak to the Notary to register a second name. This may be a family or surname, for example. Just near the Town Hall is the Weapons and Armour Shop. Here you can pick up some basic equipment for a few silver. 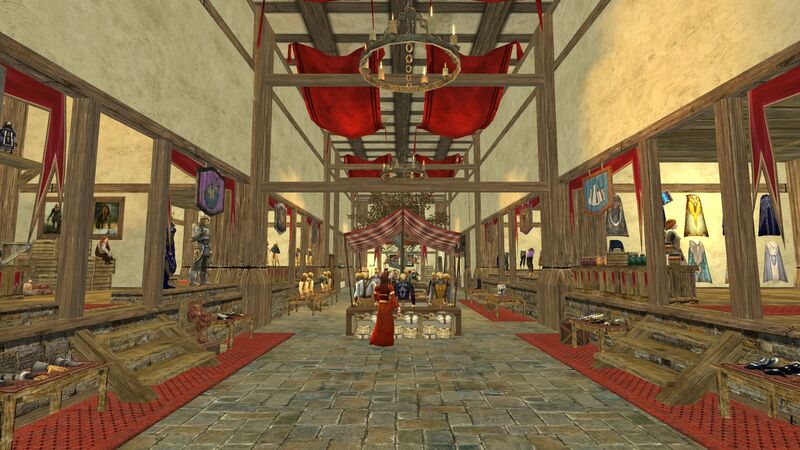 You will also find an Outfitter, which offers basic Outfits for your character, again for just a few silver. Barter Items: exchange Barrow-Treasures for healing potions, armour items and the Return to Bree Skill (for non-Race of Man characters only). 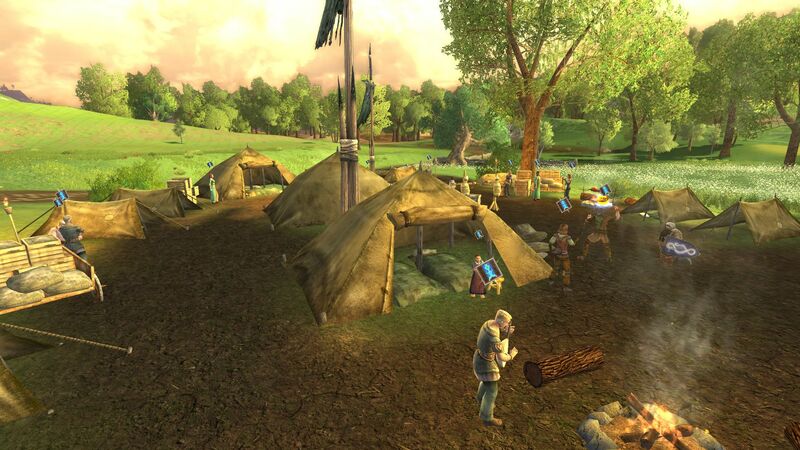 Anniversary Token Items: if you have spare Steel Tokens from the LOTRO Anniversary, you can trade them in for Marks and Fireworks Recipes. Reputation Crafting Recipes: Maggie Smallwood offers Woodworking Recipes to allow you to craft Men of Bree Reputation consumables. 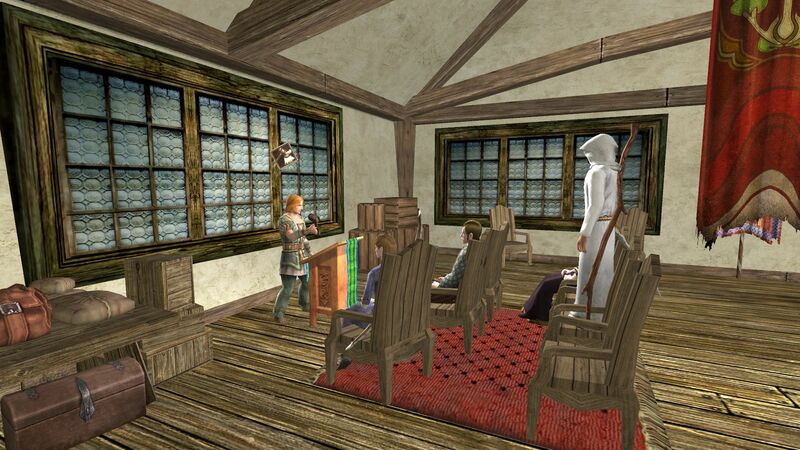 Agatha Greendale and Broderic Willowmead offer Men of Bree Reputation quest for the Barrow-Downs. 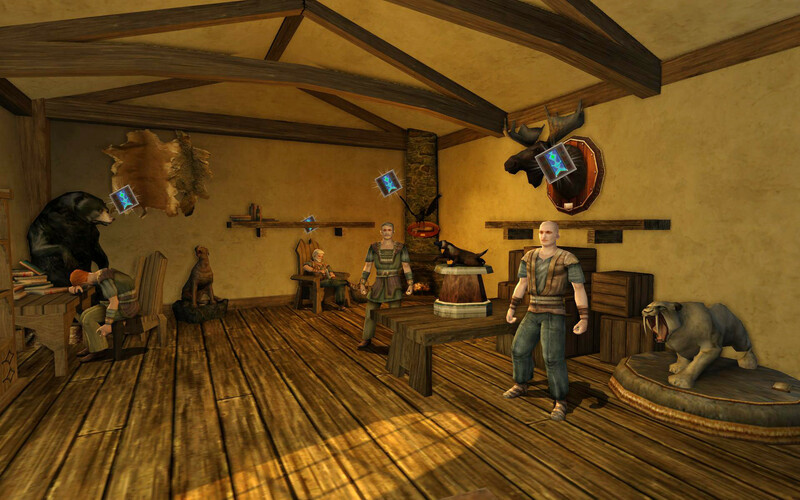 Inside the Hunting Lodge, Tully Hopwood sells cosmetics, crafting recipes, weapons and other items for coin. 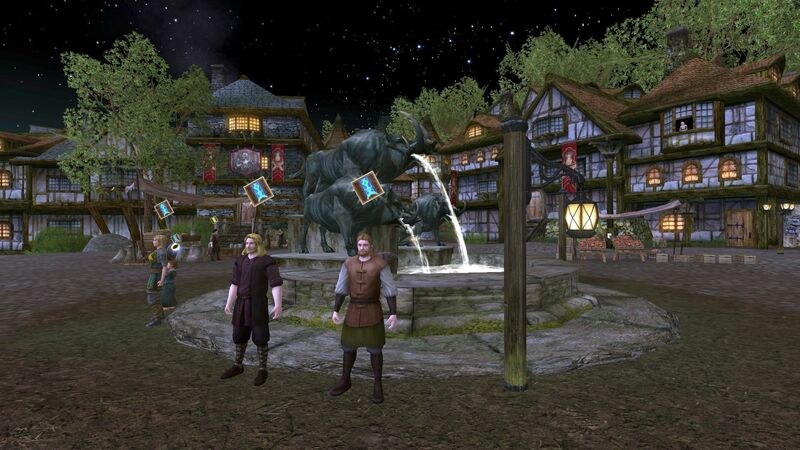 What is available to you will depend on your current reputation with the Men of Bree. The Hunting Lodge also has a nice peaceful forge for you to use, if you want to avoid the crowds around other crafting facilities. 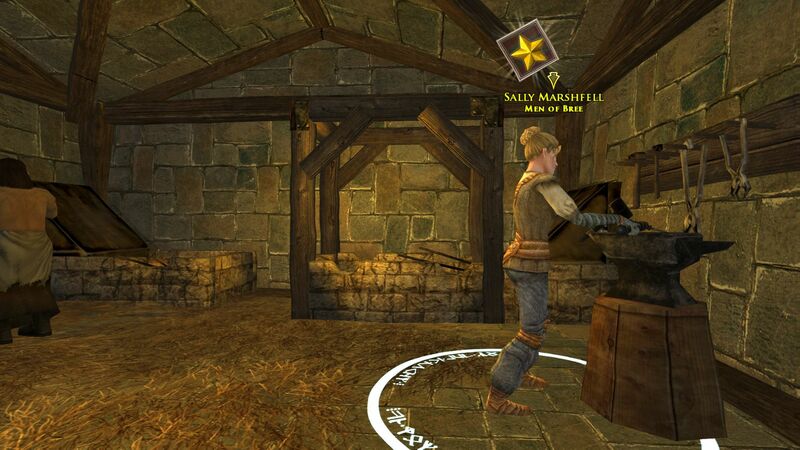 Sally Marshfell also sells crafting materials and decorations. 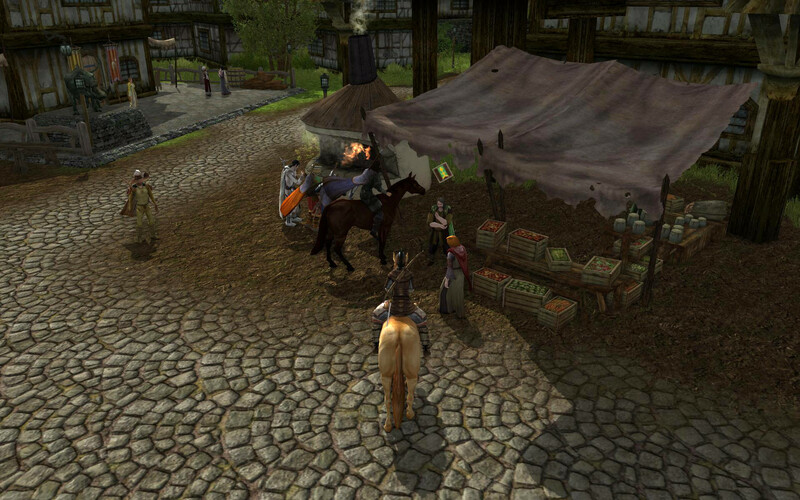 However you must be at least Ally standing with the Men of Bree to purchase items from her. Here are some of the things available to you in Bree, I’ve marked what I can on this map, so I hope you find it useful! There is more going on in Bree than this. There are items that help you with Deeds, Advanced Class Trainers, beginner’s class mission triggers and random quests. 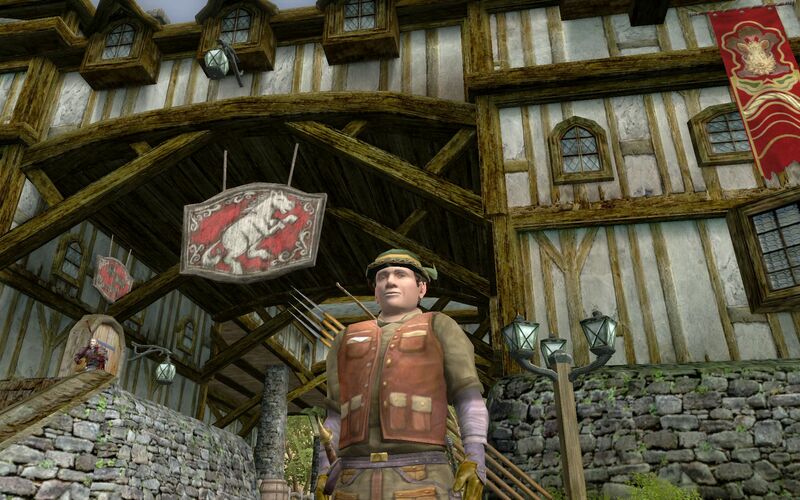 If you want a Bree-land Homestead, that vendor is here too. 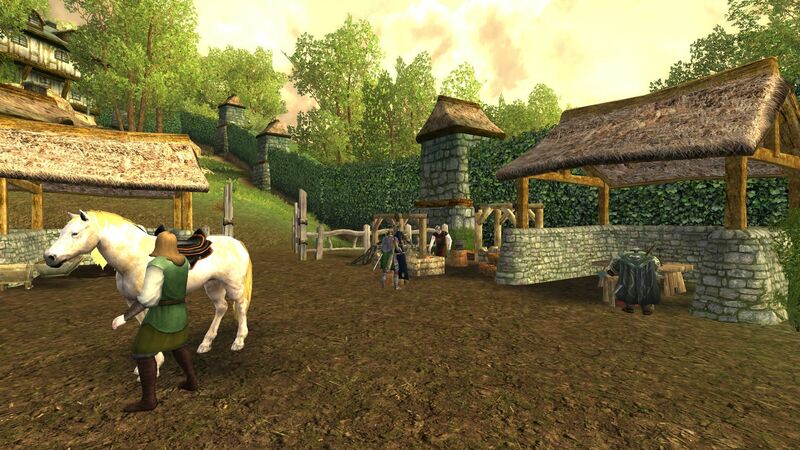 But as a new traveller into Bree this should cover the basics. And if you get lost, there are tons of people milling around who can help. I am also sure I will add to this guide pretty soon.